Who is Ayn Rand? Leon Edel calls the study of literary works for insight into the psychology of the author, "literary psychology." 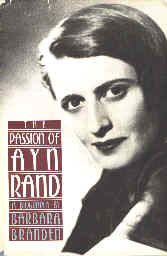 This book on the life of Ayn Rand by her close friend Barbara Branden offers insights into Ayn Rand's psychology and her literary works. The material for the early Russian experiences came from a 16 hour taped interview with Ayn Rand and the other personal material from Barbara's own experience. No one is better situated to write on Ayn Rand's life - the remarkable thing is that she did it, given the loss of her husband to Ayn Rand. As students dating in college, they first went to Ayn to ask questions about her books. Though older than they were by some twenty years, Ayn was attracted to them as colleagues and intellectual equals. Together the three of them founded the weekly seminar group they lightly called the "collective" - because it was so different from any collective that ever was. The use of the name was an inside joke. On a fateful automobile trip to Toronto, Barbara noticed from her vantage point in the back seat that Ayn and Nathaniel were completely engrossed with each other, and, out of their awareness and hers, until now, completely in love. Her subsequent questioning of Nathaniel leads to weekly private meetings of him and Ayn that soon led to a sexual relationship with full knowledge on the part of their spouses, Frank and Barbara, although they are sworn to secrecy. Frank is asked to leave their apartment every week when Nathaniel comes over so that Ayn would never be seen in public with another man. Frank is driven to drink and Barbara to distraction. How the relationships evolve between each of the four parties to this secret pact is the heart of the suspense of this gripping book In its pages Barbara has created a plot from real life as powerful as that in "Atlas Shrugged" and has done it with the skill of Ayn herself. One bonus from Barbara's story not present in "Atlas Shrugged" is we hear the rest of the story. We see the dramatic end of her relationship with Nathaniel and then learn how Frank and Ayn spend their last days together. Those who have wondered about the break-up of the Objectivist movement and the Nathaniel Branden Institute can get their questions answered in full measure within these covers. Those who have wondered about her days in Russia have likewise a special treat in store. Barbara Branden has provided a definitive answer to the literary question, "Who is Ayn Rand."